A nation-wide charitable organization called Best Buddies fosters strong friendships between high school and university students, and individuals with intellectual disabilities has come to Kwantlen’s Richmond and Surrey campuses. Students are matched up by chapter presidents to community residents who share interests, personalities and schedules. And the rest is pretty much left up to participants. “It’s up to the students to make and develop their friendship as they want,” said Amy Lynn Taylor, the Western Canada program manager and current chapter president for the Surrey campus. “We hope they are meeting as frequently as they’d like to,” she said, adding that students and their buddies are encouraged meet a minimum of twice a month. Depending on the pair, time between students and their buddies is spent doing what the average young adult does: shopping, dining, movie-going and chatting. Ora Chen, Richmond chapter president, spends most of her time with her buddy Winnie shopping at Richmond Centre. “Our relationship is very good; she thinks I’m really a good friend, and she’s really good in our friendship,” Chen said. While the chapter presidents generally host four group meetings each school year, the program is mainly meant to provide a safe and encouraging way for students to get involved in the communities around Kwantlen, and meet and interact with people outside of school who don’t necessarily have the same opportunities as they do. Both chapters work closely with Community Living British Columbia, an organization that works with adults who have intellectual and developmental disabilities. As Taylor explained, the community clients from CLBC genuinely appreciate being able to meet students, go out, have fun and spend time with people who enjoy spending time with them as well. The Surrey and Richmond chapters are relatively new, and as there are currently more buddies than volunteers, both chapters are always seeking student participation. Students can participate in either the Surrey or Richmond chapter for as long as they attend Kwantlen, or have the time to commit to the program. But even when schooling comes to an end, the friendships made between students and their buddies often don’t. “In a lot of cases, they do continue to stay in touch,” Taylor said. 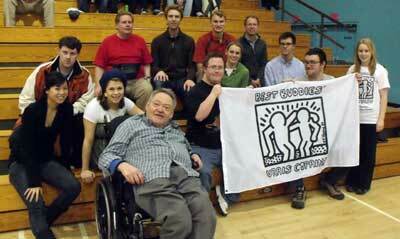 For more information on the program, visit www.bestbuddies.ca, or seek out the Best Buddies booth at the Kwantlen volunteer expo being held at the Surrey campus Nov. 23 from noon-5 p.m., and at the same time on Nov. 24 at the Richmond campus.